How many ornaments you need to decorate your Christmas tree can vary from one designer to the next. Below is a chart designed to help you determine the how many ornaments you need to decorate your Christmas tree. Some people prefer more ornaments on a tree than others, so personal preference may skew the count slightly. Mixing and matching ornaments sizes adds variety and depth to the tree. Different ornament sizes can vary how many ornaments you need for your tree. 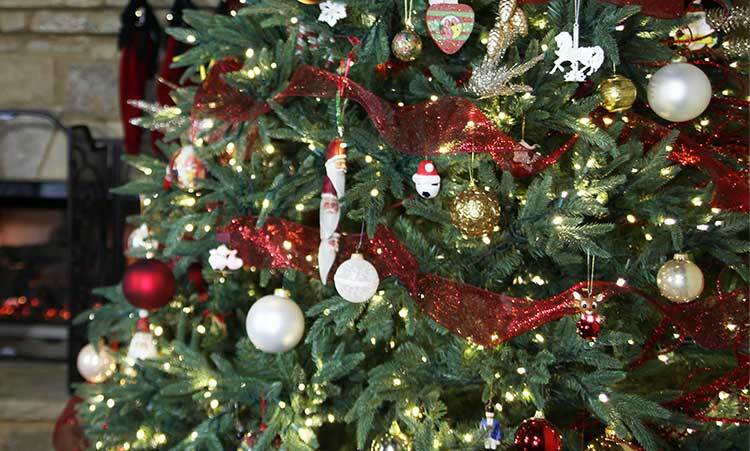 Make sure you put some larger heavier ornaments at the interior of the tree to protect them and add depth. Smaller lighter ornaments work best on the tips of branches. Different sizes and types of ornaments can fill gaps and holes in the tree. Don’t be afraid to place different sizes of ornaments together on the tree. •Natural browns, golds, greens. Add in some birds and bears! •Consider a fun separate DIY or kids tree to showcase handmade ornaments. It is also important to consider what kind of tree would display your ornaments best. Remember that the size of the tree will determine how many ornaments you will need. •If you like a tree full of ornaments, consider the Brighton Fir. Its staggered offshoots to provide lots of hanging space. Additional trees that are ideal for hanging larger ornaments include the bark-wrapped Fraser Fir and Canadian Fir trees. •If you have heavy ornaments that need sturdy branches or you clip ornaments to the branches, the Sequoia Fir tree is your best pick. The elegant Sequoia Fir has extra durable tip and branch construction while still offering room for hanging. Glass Christmas ball ornaments on ChristmasLightsEtc.com are available in a wide variety of colors, sizes, and finishes. You can decorate these ornaments to make Christmas gifts for friends and family. Personalized ornaments are also a great idea if you have a certain specific decorating scheme in mind. Decorate them with some paint, glitter, or ribbons, sequins – fill clear ornaments with fun DIY idea designs. •Do add some matching ornaments to garland and wreaths to keep your decorating style consistent throughout the room or house..
Christmas Lights Check them out today. Cheers!